No Preservatives. 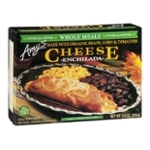 Ingredients: Organic Black Beans, Organic Corn, Filtered Water, Organic Tomato Puree, Organic Onions, Organic Corn Tortillas (organic White Corn Cooked In Water With A Trace Of Lime), Monterey Jack Cheese (pasteurized Milk, Culture, Salt, Enzymes [without Animal Enzymes Or Rennet]), Cheddar Cheese (pasteurized Milk, Culture, Salt, Annatto [color], Enzymes [without Animal Enzymes Or Rennet]), Olives, Expeller Pressed High Oleic Safflower And/or Sunflower Oil, Organic Green Chiles, Organic Bell Peppers, Organic Sweet Rice Flour, Spices, Sea Salt, Cilantro, Organic Garlic. Contains Milk. Individuals With Food Allergies: This Product Is Made In A Facility That Processes Foods Containing Wheat, Soy, Tree Nuts And Seeds. Amy's Kitchen Does Not Use Any Peanuts, Fish, Shellfish Or Eggs.